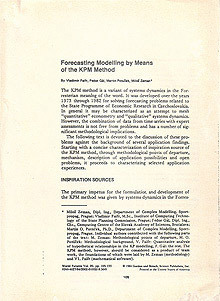 The KPM method is a variant of systems dynamics in the Foresterian meaning of the word. It was developed over the year 1973 through 1982 for solving forecasting problems related to the State Programme of Economic Research in Czechoslovakia. In general it may be characterized as an attemp to mesh "quantative" econemtry and "qualitative" system dynamics. However, the combination of data from time series with expert assessments is not free from problems and has a number of significant methodological implications. The following text is devoted to the discussion of these problems against the background of several application findings. Starting with a concise characterization of inspiration source of the KPM method, through methodological points of departure, mechanis, description of application possibilities and open problems, it proceeds to characterizing selected application experiences. ČLÁNEK KE STAŽENÍ (PDF) – velikost je 8,2 MB.